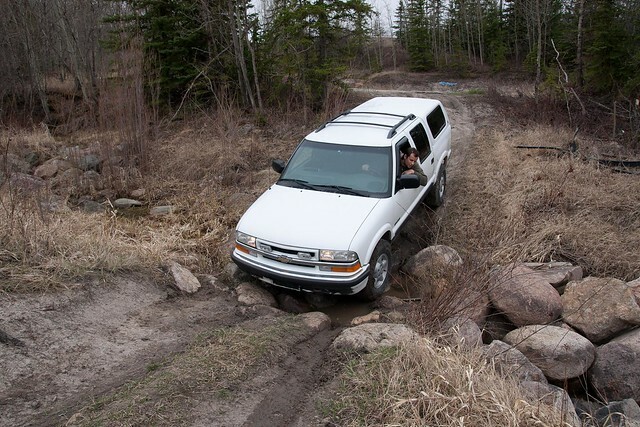 Well, after living in the city for 2 years, and spending all last summer building up my Blazer I've finally gotten out and used my 4x4 a little. I took my 3 boys and my brother in his 4 door S10. There wasn't a lot of mud, but we had some fun trying to climb a few hills. 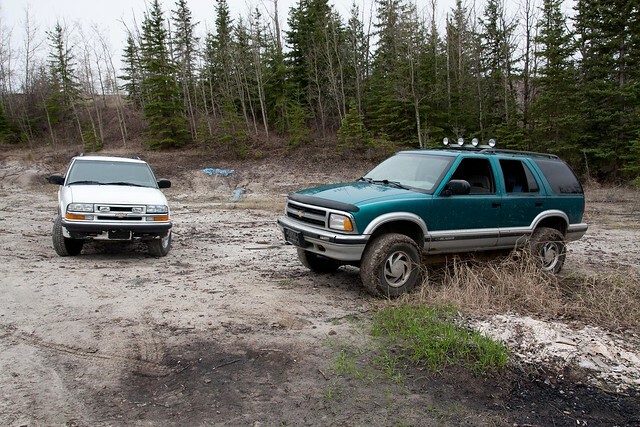 Here's my Blazer and my brother's S10. My bro crossing a trickle of a creek. Me failing to climb a muddy hill. It was wet clay and just caked my tires. Climbing a hill. I hoped it would be a bit more muddy, but I didn't even slip a tire. Then we found some more trails and sand hills. It was a lot of fun climbing the sand hills, except there was a lot of dirt bike tracks making ruts across the hill which made it hard to keep momentum. All in all, we had a lot of fun, and found out there's a lot more trails that we can access. Hopefully we can go again in a couple of weeks. Looks like you had a pretty good time out there! Hope your boys had as much fun as you did! We did have a lot of fun. 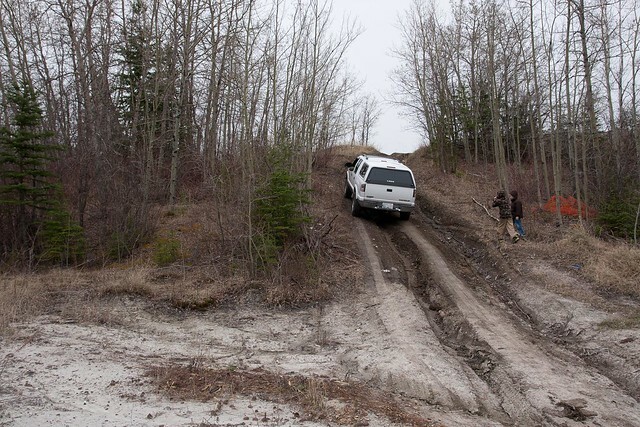 My boys love riding in the Blazer, and kept telling me I needed to make "one more try" after every run up the sand hills. We're excited to go back in a couple of weeks and explore more trails. There's some swampy muskeg areas that we're hoping have trails in them. 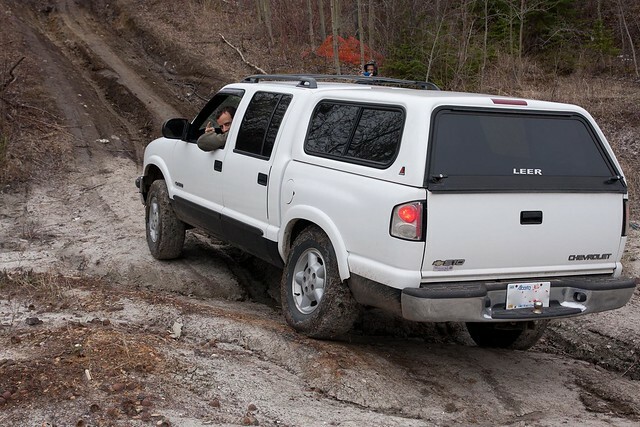 is there any way of getting some pics of the light bar on you blazer?? Sorry, I missed your question. Things have been really busy and I haven't been on in a week or so. My light bar is just a 1.5" aluminum L bar bolted to the roof rack, with some cheap 5" H3 lights. The wiring isn't too pretty or special: it runs down the driver side passenger door into the cab. I'll try to remember and take a couple of pictures. I doubt I'll do a SAS on this truck in the near future. For the moment it's parked with reduced insurance and I'm driving my wife's vehicle for the summer. My bro moved 5 hours away, so I don't really have anyone to go wheeling with and not a ton of motivation to work on the Blazer at the moment. Finally. Someone found a use for a Jeep. Stuck in Charleston SC, help anyone?